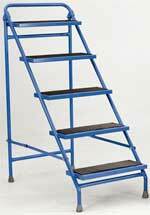 We have a wide range of Portable Steps, Step Trolleys and Wheel-along Steps. Suitable for a variety of applications in warehouses, offices and storerooms. Ideal accessory for storeroom, office, workshop, library etc. 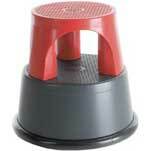 Heavy duty rubber bumper around base for ultimate grip. Mounted on 3 spring loaded castors, which retract when weight is applied. Double sided hoof style spring loaded 2 tread with single sided handrail fitted with ribbed rubber or anti-slip treads. Wheelalong 2 tread fitted with ribbed rubber treads or anti-slip tread. Wheelalong 3 tread fitted with ribbed rubber treads or anti-slip tread. Wheelalong double sided 2 tread step fitted with PVC feet and ribbed rubber treads or anti-slip tread. Wheelalong 4 tread fitted with rubber treads or anti-slip tread . Double sided hoof style spring loaded 2 tread with double sided handrail fitted with ribbed rubber or anti-slip treads. Folding 3 tread step fitted with GNM rubber feet and ribbed rubber treads. Folding 4 tread step fitted with GNM rubber feet and ribbed rubber treads. Folding 5 tread step fitted with GNM rubber feet and ribbed rubber treads.